dance.net - Experience trimming/cutting a wig (or suggestions for an adult dancer) (10170391) - Read article: Ballet, Jazz, Modern, Hip Hop, Tap, Irish, Disco, Twirling, Cheer: Photos, Chat, Games, Jobs, Events! I'm hoping the collective wisdom of ddn can help me here. I'm an adult dancer, I'm only 5 ft. 4 in, and I have a relatively small face/head (I can usually fit into hats made for little kids). I really need to find a wig. I have very fine, short (chin length) hair. When I style my hair for a feis, I just can't keep any volume in it, and it's too short to try to curl (assuming my hair would hold the curl). Additionally, I'm getting my first solo dress, and need to find some way make my hair fit the look. My TCRG is open to me getting a wig of some kind, but does not want me to look too young in it. She would like something with a loser curl, doesn't generally like the split curl wigs (in the reddish, blond color I need, it's looks too hairsprayed, if that makes sense). The biggest thing is that she doesn't want anything too full or long, as she thinks that wouldn't be appropriate for an adult dancing in the adult categories. I tend to agree - I don't want anything that would overwhelm me. My TC has looked at the Roisin wig from Celtic Curls (billed as a good choice for adults), but thinks it would be too much for me. I could get a bun wig, but given how short my hair is, I would have to use a ton of hair spray and spray gel to get the back up, and I think it would look very messy up close. I thought of another potential option this weekend. I am wondering if if anyone has had success with trimming/cutting a wig. I was thinking I could take the Roisin wig to my hairstylist, put it on, and have him shorten it and take out some volume by adding some layers. 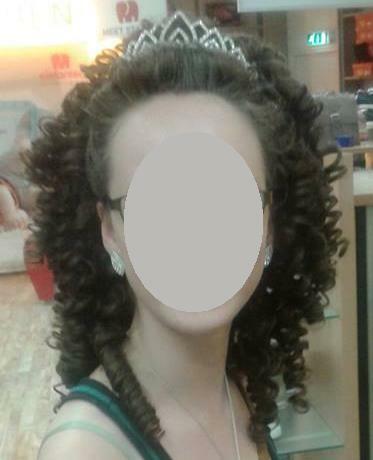 I have heard of parents trimming wigs to take off some length to fit their daughters, but haven't really heard of anyone reshaping the wig to take out volume. I'd love to hear from anyone who has tried this or from anyone who has had a similar problem and what you solution you may have found. Thanks! If your hair does not curl well, the Roisin won't work. It has to be blended with the front of your hair. It does not come around all the way on the sides. The curl is all behind the shoulders and head. Celtic Curls will be at Feis Na Tara. Email her ahead of time, with what you are wanting and possible color choices. Camelia Rose and Matila Murphy vendors should be at Peach State this year. They both also carry a loose curl wig selection. They are pricier, so you might not want to cut them. Your hair always looks great at competitions. Of course, that is my opinion. But you have a great hair cut and it suits you very well. My hair goes EVERYWHERE, so wigs are a blessing from God to me. (So is K from Celtic Curls!). There are several &over champs who do not wear wigs with their solo dresses. I will try to find some pictures of the ones I am thinking. One of them placed in the top 3 at Peach State in the 18&over champs. There are others. You could find a great flower, headband, or fascinator to wear with your dress. It may be just a great, TCRG approved, accessory that pulls it all together. Looking forward to seeing your dress! Seeing that you're not too tall and you have a small head, I can thoroughly recommend the Aoife from Celtic Creations. I used to wear it (5'7"), but changed it for a bigger wig when those became more popular. However, I have never had a more comfortable and long-lasting wig. The Aoife has beautiful fat ringlets, that are easily separated to make even looser curls. In the picture is a girl in my group, who is about your height and petite. She bought one of my Aoife wigs and split the curls. You might want to consider a bun wig! I'm an adult and I find that the bun wigs give me a more mature look. You might look into the Ashline wig from Emerald key for a full wig. It has looser curls but isn't as full or long as their Seaneen. They also have a large loose curl bun wig called the Orla which might also work. You can pin and style it so that it will cover the mess of pins and such in the back.